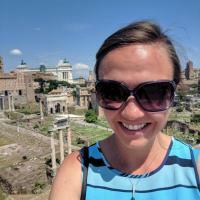 Melissa Huber is a sixth-year PhD student in Classical Studies with research interests in Roman history and topography, especially the social and political history of the Roman Principate. Her dissertation entitled "Monumentalizing Infrastructure: The City and People of Rome in the Time of Claudius" investigates the literary, epigraphic, numismatic, and archaeological evidence for building under Claudius from a social historical perspective. She uses her training in digital technologies to visualize the evidence in new ways. Melissa received her AB in Classics and BS in Mathematics from the Honors College at the College of Charleston, and her MA in the City of Rome (Classics) from the University of Reading with funding from the Society for Classical Studies' Lionel Pearson Fellowship. “An Emperor Makes His Mark: Claudius’ New Letters in the Epigraphic Record,” Society for Classical Studies Annual Meeting, San Diego, California, January 2019. “Claudius and the Monumentalization of Water Supply Improvements in Rome,” Classical Association of the Middle West and South Annual Meeting, University of Waterloo, Kitchener, Ontario, April 2017. “Mapping Changes in Water Supply Under Claudius,” Mapping the Past: GIS Approaches to Ancient History, Ancient World Mapping Center- University of North Carolina at Chapel Hill, April 2016. “Monumentalizing the City: Republican Building Traditions in Augustan Rome,” Mediterranean Studies Association 18th International Congress, Athens, Greece, May 2015. “Etruscan Cities,” Duke University, Organizer, public exhibit on Etruscan cities, April 2014.